As reported in my last post, nothing is blooming outside, so we'll have to be a bit creative. My amaryllis, which I bought after Christmas, is blooming! One bud has three flowers and the other two. The flowers are such a vibrant red, they make me smile. And see the little Easter rabbit decorations that look like chocolate (but are resin, so please don't try nibbling the ears!)? Yes, dear blogging friends, that proves I finally took down my indoor Christmas decorations in mid March! Ahem. It's just that I love them so! And, well, OK, I've been lazy about it. Here are the blooms up close, just so you feel you get true GBBD impact. And there real blooms end, but let's use the trick of light and shadow to create more blooms. Presto! Here's a cute light I got at Ikea. The cord is green and I just happened to have paper in a very close color, so I made some leaves. 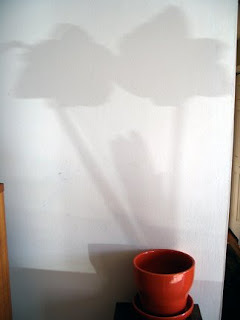 And here's a shadow bloom of my amaryllis that I noticed the other day... I just moved a cute new (well, new to me anyway) orange flower pot to look like its pot! Happy bloom day, everyone, and thanks to May Dreams Gardens for hosting it. 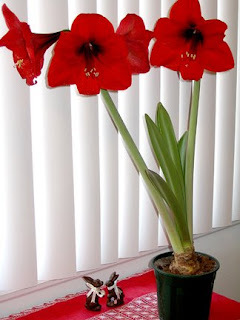 LOL, Monica, when we live in the frozen North, we have to get creative in finding blooms--you certainly have:) Your amaryllis is beautiful, though; mine never bloomed! What an awesome amaryllis! It is perfect. The light is too sweet! Brilliant red! Who could not smile when seeing those blooms? 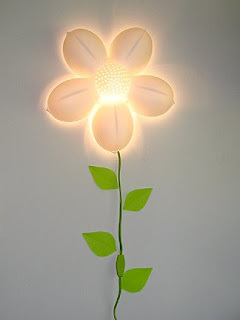 Such a creative addition to the flower light. You should get the big bucks for the leaves. :} Maybe by next month we will have some blooms in our gardens! Hi Monica, hope you enjoy the nice weather and the park! Your amaryllis is gorgeous! You & my daughter have a thing for Christmas decorations. She still has a winter snowglobe & a mini Christmas tree in her room which she refuses to let me pack away. Your Amaryllis is a beauty, such a rich ruby. That first picture is wonderful! The red and the white.. just gorgeous. You've a good eye for composition.. and a wonderful sense of humor with that light. What a great idea! Your amaryllis shadow-in-a-pot is brilliant. 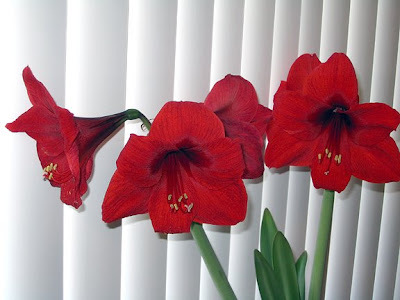 I love the amaryllis, it is such a fun plant to grow. Yours is beautiful. Beautiful Monica. Mine are still in the basement, not even started this winter. I need to check on them. Thanks! Your comment brightened my day! I'm *really* hoping to have crocus and snow drops for next month's GBBD. For some reason (perhaps they are not members of the Cats Union), my cats leave my houseplants alone--except for the wheat grass I grow them, but they know that's for them. We went to 11 parks--that's 30 down and about 130 to go!! As it goes, I overlooked six little paper/foil angels in my office and the Santa on my side door--but I'm going to leave it up a while as it's a plastic hseet and also provides wind proofing on my north side!! I've never staked my amaryllis. Maybe because it only had 2 and 3 flowers per bud, not 4, it wasn't top heavy. Aside from the Xmas decorations I genuinely overlooked (see comment to MGRR above), I keep a few things out year-round on purpose: some paper bells with mercury beads hanging in my bedroom (see here) and a nutcracker (who looks like a hiker) and a twirly (wooden pyramid) with deer (see here) on my mantel. Thanks--I've done some layout and design (as a writer, not a designer) in my day job. I'm going to try to keep it for next year, by planting it out over summer. We'll see if it reblooms! I bet they still bloom! Hehehe, the shadow flowers are very cool, Monica! Mom loves Amaryllis but unfortunately we do too... You were curious what she's studying: Latin American Studies. Language & Literature, History and Politics. We are already preparing our poor sensitive cat ears for all this 'I don't find a job' whining... Paws crossed that it turns out okay! Fun post, clever Monica! You must be as giddy as I am on this 65-degree day. Happy St. Patricks Day! A pop of bright red to brighten your day! That amaryllis is wonderful and I love your light and shadow one too! Such inspiration and imagination you have. The little rabbits are so cute.